As you may know, DoYouBuzz rebooted itself a few months ago. The application was completely rewritten, with a new version having been launched in April 2014. And so was the company itself, with the implementation of a new organization that is more horizontal and based on trust. We broke some unnecessary rules that were in place, changed the way we decide things, and established flextime (flexible work hours) and teleworking. To understand our reboot, I invite you to read or re-read this great article. It’s time to tell you about a very powerful thing, without which none of this would have been possible: the culture of DoYouBuzz. Indeed, culture is the little extra thing that will make a competent team becomes a magical team. Without culture, there is no passion, no fun, no trust… It is difficult to let your company be free without in parallel asserting its own culture. This is what we did, but the road was long. Here is the story. I must admit that 10 years ago company culture sounded to me like a completely hollow, if not false, concept. A trick of large companies, much like when the Orange boss tells you respect for customers is one of their fundamental values and then you find yourself pulling out your hair for more than two hours on the hotline. Or like when the boss of Enron emphasized its integrity and transparency…a few months before the accounting scandal broke. Unbearable. At the same time, I felt a certain fascination with “cool” companies, like HP in its infancy, Atari in its heyday, and, more recently, Google. Seeing young people in t-shirts playing foosball at work was a very exciting thing, and a little confusing at first. Ok this is a cliché, but I still remember my surprise when I discovered the famous “startups” on TV in 1998 or 99. It was great, but so far from classic corporate culture that it became suspicious, or even creepy. “Even the boss is wearing a t-shirt.” Too fun to be true. Unnoticed to me, a new form of corporate culture was appearing before my eyes: “cooler,” more respectful of individuals on certain points, and less stuffy than the “old school” culture of traditional businesses. And I was very sensitive. This was actually one of the fundamental reasons that led me to focus my studies and my career on the web and startups. Three years ago, I had the opportunity of visiting Zappos in San Francisco. Discovering this very special company was like a nice slap in the face. Mind-blowing numbers, a huge success story, and unparalleled customer service. You can order a pair of shoes that is of size 42 for the left foot and 43 for the right…all while ordering the delivery of two color variations for you to return one (or both) after trying them out at home. Amazing! But that was only the first Kiss Cool effect. Another aspect of Zappos’ presentation was about the company’s culture. The CEO, Tony Hsieh, had just written a book entitled “Delivering Happiness” (graciously given to me on that occasion, thank you! ), where he explained how the goal of the company was to enable employees to thrive in the job and be happy. 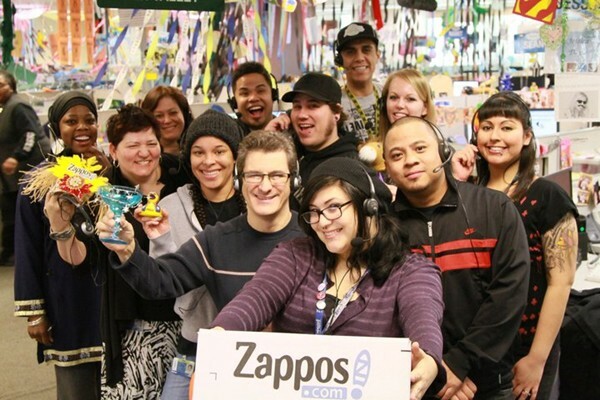 Then we discovered pictures of the Zappos teams (call centers, in particular), that showed the company’s incredible workplace atmosphere. One of Tony’s key sayings was “culture eats strategy,” a strong, visionary sentence. This visit was amazing, even though, in retrospect, I only got half the point. I had the feeling of having found an awesome company, but I didn’t really consider how DoYouBuzz could need any of this. All successful startups seem to agree on one point: the quality and strength of a team are the prime factors of a successful entrepreneurial venture. This is true for most businesses and is even more so for a startup. When you don’t know exactly what you are selling or how you should sell it, or to whom, it is better to have a motivated and solid team to be able to evolve in the middle of all this uncertainty. And this is where culture becomes essential. Created in 2007, DoYouBuzz has been through many ups and downs and overcome many hardships that sometimes bordered on disaster. Interestingly, of the seven people that work at the company now, six have been with us for more than five years. Why such loyalty? The main reason is simple: we love working together, we like to evolve together, we have shared values. Precisely this is culture, and it is reinforced by the fact that we share a strong and ambitious mission: help people find a job and succeed in their careers. Startups in Silicon Valley have turned the creation of a company into a science. This is what Y Combinator (or The Family, in France) also teaches us. Managing a startup is a science of execution, implemented by people who must have initiative and try new things every week, making use of data, APIs, and everything else. Google calls them Smart Creatives, Facebook speaks about the HackerWay, and you also hear people talking about startupers, techies, founders…and, of course, talents. Whatever they are called, the key is to attract them and to make them work together. But how do you make these people be perfectly aligned and completely free? You give them a clear strategy, perhaps? The problem is that strategy can change very often in a startup. Yep, the best solution to align people is to have a common culture and an inspiring mission. A strong culture that becomes the number 1 hiring criterion. Today we are pleased to present you the values that drive us, our methods, our beliefs…in short, the DoYouBuzz culture. A culture that has been built little by little, that evolves continuously, and that is now well entrenched in us. Here you can find the presentation of DoYouBuzz’s culture in its original version (with animated gifs) or watch the Slideshare below. Today, we have the feeling of being a real startup, i.e., a growth company that (very quickly) explores new customs and economic models. As “startupers,” we finally got rid of the old management and authority schemes, which allowed us to release the creativity of each of us and increase our productivity. Collective intelligence can sometimes sound like a somewhat hollow concept, but believe me, when you have the chance to work in a nurturing environment where people are gifted with computers, transparent about their actions, dare to say things, and seek to work together to continually advance…then right there the collective intelligence becomes something very strong. In fact, Culture, it’s a little like the Force. A very powerful thing, a little magical, that requires maturity and a long learning process. May the Culture be with You !